Introducing Camille and Mags the Co-Founders of London's fitness review site Reputation. These gals are a force to be reckoned with and have successfully navigated their career journeys from high-flying advertising creatives to business owners, with a vision to become the TripAdvisor of the fitness world. Read about how they came up with the idea, who they work with and why you shouldn't take too much on when you first start out. Tell us a bit about Reputation Fitness, how you got started, what you do and where did the idea first come from? MAGS: Cam invited me and another work friend to a free run club she’d heard about on Brick Lane where classes were taught by different influencers every week. We absolutely loved them and started going regularly but realised that some were so much better than others. After some digging, we realised that there wasn’t any one single place where you could check how great classes were before spending a fortune on them- hence reputation was born. CAM: From our love of exercise classes! Finding the best classes to go to isn’t easy, we were getting frustrated by the ones we’d made the effort to go to that weren’t as we good as we’d expected. We were craving a review system to filter classes based on true experiences rather than just location and generic class descriptions. What's it like working as a partnership? CAM: I love building a brand that I believe in, but doing it with a friend is a real bonus. Mags and I have worked together for the last 5 years, so we know each other’s strengths and weaknesses pretty well. Being able to bounce ideas off one another is invaluable. Challenging each other daily and learning new skills together. Knowing the other person is there to support you at the more challenging times keeps us going. MAGS: Amazing! It’s invaluable having someone else as invested in an idea as you are. When one of you hits a bit of a slump, it’s great to have that encouragement and drive from a friend. We love the name ... how important do you think reviews/reputation is when it comes to Londoners choosing a spot to exercise? MAGS: Reputation is everything! Our background is in advertising, so we’re used to working on big brand campaigns but as fitness is so personal, we’ve found that no matter how glossy or slick a studio’s marketing is, reputation and word of mouth recommendations are key! We love the idea of levelling the playing field so that great classes speak for themselves. CAM: Super important. Londoners are so busy, juggling demanding jobs, family, hectic social diaries, kids! We wanted a place we could quickly go to where we could choose to spend our valuable time to get the best experience for our time (and money). CAM: We both love trying new classes. I like to mix classes up to keep me on my toes. 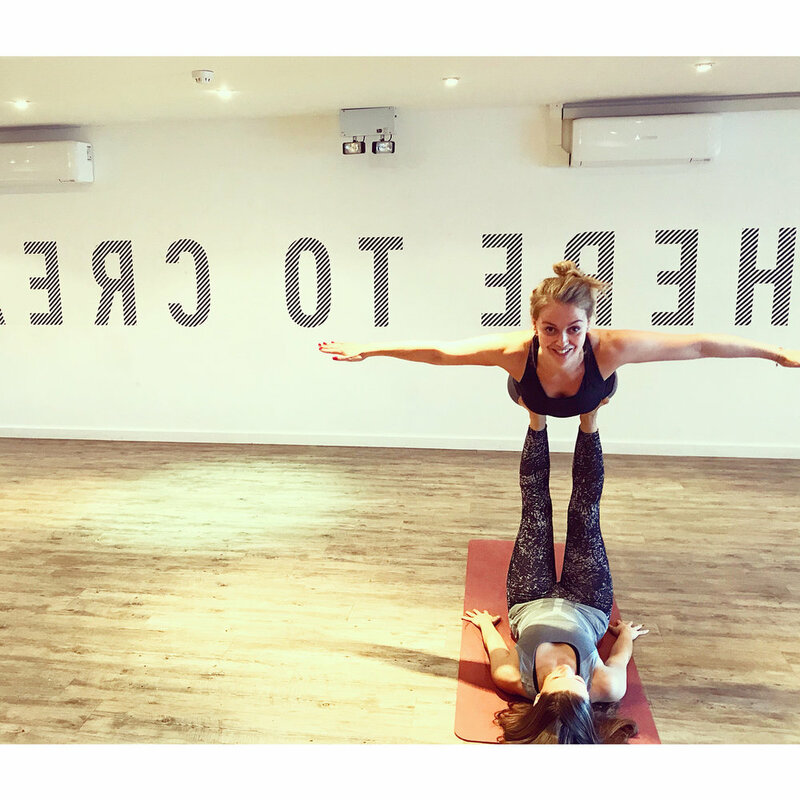 I recently did an Acroyoga class that surprised me how much it challenged me both mentally and physically, and left me with a huge sense of achievement on leaving. I’m a bit of a fair weather runner, now that Spring is around the corner I’m looking forward to getting back outdoors and attending some run clubs again. MAGS: Yoga has become my go-to workout. Coming from a very cardio-based exercise background I’ve only very recently started to appreciate just how much my body and mind thank me for dragging myself to a yoga session. I’m loving Another Space’s hot Vinyassa flow or Hot Pod’s morning sessions! CAM: Know your product, have self-belief and you're halfway there. If you don't have a financial backer or like us, haven’t found your gold pot at the end of the rainbow be smart with your time and money. Carve out times of the day dedicated to doing only that and don't let it impeach on other areas of your work/life balance. It’s hard being strict on yourself, there’s always a never-ending list of things to be done. MAGS: Test the water- research, plan and do as much as you can on the side so that you don’t have added financial pressures whilst the business is in its' infancy. Prepare to fight for ideas worth investing your time in. 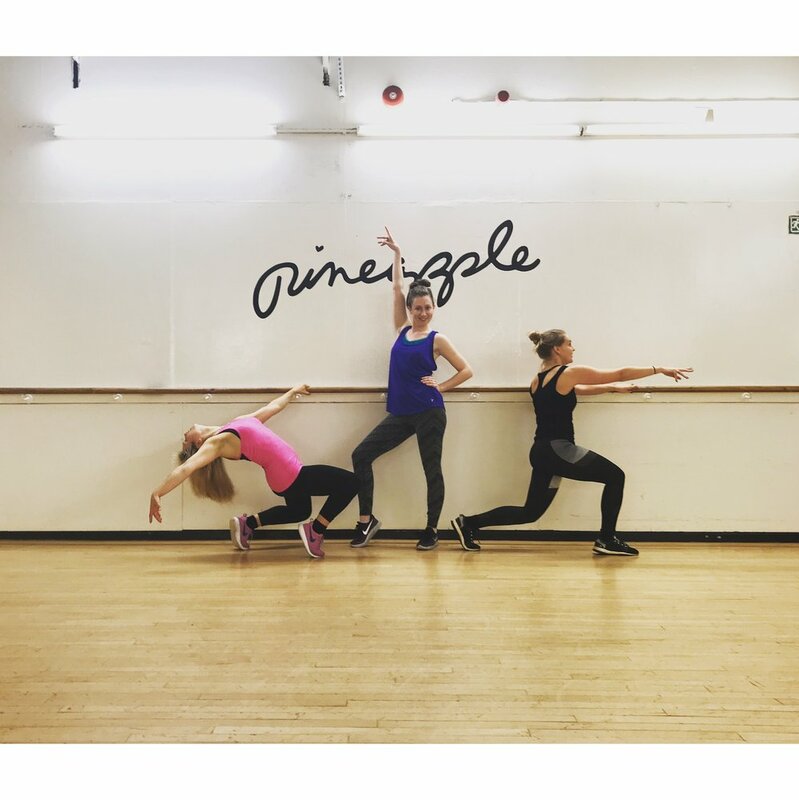 Nat joining Cam and Mags for a workout at Pineapple Studios... She now reckons she's gonna be a big deal in the dance world. Have you found any specific differences being a female-run business in the fitness industry? MAGS: We’ve met so many supportive males and females in the fitness industry! As it’s traditionally quite a male-dominated space, most of the female entrepreneurs we’ve met so far have been really encouraging- it’s like getting a glimpse of this open-minded, welcoming alliance. The big push to get women into coding and tech start-ups has also been a god-send! I came into this knowing we’d have to have a very DIY-attitude around launching our platform so learning the basics of building a site through attending the Woman Who Code sessions, along with hundreds of hours spent on Youtube have been invaluable! CAM: As Mags said, everyone we’ve met (men and women) so far has been incredibly supportive- it must be all those endorphins! A lot of the classes we take part in have a higher female attendance ratio to men and a lot of the time are led by female instructors. It’s great to chat our idea through with them and constantly improve and adapt based on people’s feedback- it makes us feel like we’re building a product people will find useful. MAGS: Getting gyms to take the plunge. Opening yourself up to reviews is always quite a daunting prospect- but people are reviewing/ critiquing/ commenting on workouts already! It’s just about bringing that fragmented information into one place. We want instructors and start-up fitness studios to focus on doing what they love, whist their following do their thang in spreading the word! CAM: Exactly as Mags said, the initial hustle of getting gyms signed up was harder than either of us had expected. Although everyone’s been super supportive and excited by what we’re building, it can be daunting to be the first ones, especially for the bigger gyms. We want to become the platform to help small (and large) studios shine and hero those individual instructors that are smashing it. What advice would you give to someone thinking of going freelance/starting their own business? CAM: Don’t take too much on too soon. Do less better as opposed to more not so well. It’s important in the early stages of a start-up to take time to evaluate, reflect and establish long-lasting relationships. What's the big idea/grand plan? MAGS: Initially, levelling the playing field. Enabling great classes to speak for themselves regardless of how big marketing budgets are. The bigger goal is to create a fitness community that bring new workout experiences to people- we’re all about keeping people moving, in a way that suits them. CAM: To become the ‘TripAdvisor’ of the fitness world and help to build a community of fitness enthusiasts. Do you have a quote that you live/work by? MAGS: Anyone can have a great idea, the difference between those that make them happen isn’t luck or magic- it’s frickin’ hard work. CAM: Everything starts with somebody's daydream. Don’t give up. To find out more about why London's best gyms and fitness solutions deserve a reputation and to read reviews from fitness-goers visit their website or Instagram. Know of any incredible classes the girls should try? 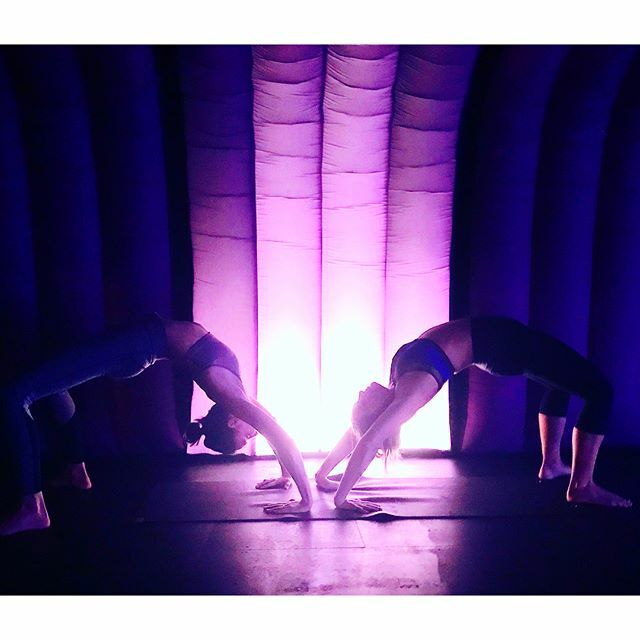 From intense sweat-building to oh-so satisfying yoga stretches, they're all ears - so get in touch!